Active involvement in music and singing can help counteract many negative aspects of modern life such as alienation, isolation and depression by promoting mental health and physical well-being. With this in mind, the 2009 MiC Awards sought to recognise acheivements in community music that highlight the health and wellbeing outcomes of community music. Two outstanding music organisations, whose benefits to their communities extend far beyond the music, were winners of the 2009 Music in Communities Awards: Canberra-based Music for Everyone and an innovative program for people with disabilities, Ambient Orchestras, in Victoria. 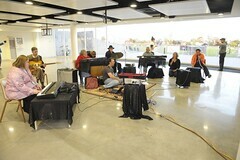 There were four Runners-Up in the 2009 Music in Communities Awards, each receiving $2500. 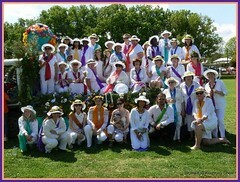 The Women In Harmony choir was formed in 2005 after several racist incidents had rocked the local community. The choir came together to enable women from all cultural backgrounds to celebrate diversity by learning music in each other’s languages - at the same time sending a powerful message about tolerance and togetherness on its own doorstep. Since 1995 the Melbourne Scottish Fiddle Club has been meeting monthly to learn and play the fiddle music of Scotland and the Scottish Diaspora. Since the beginning the group has had an inspiring commitment to bringing young and old together to learn from and with each other. This community group provides tuition, mentoring, resources and facilities for budding young musicians in the regional town of Willunga. It has become an integral part of its community, helping otherwise socially-isolated young people connect with others through music and performance. 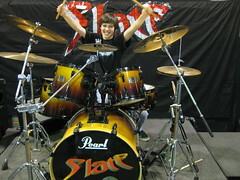 Now Academy of Rock participants also range from complete beginners, experienced musicians looking to refine their skills and teenagers needing support with their high school music studies. For over nineteen years The Brunswick Women's Choir has been supporting women in the Brunswick area to sing, sing, sing. The make-up of the Choir has changed over time but its commitment to social justice and affirming women's experiences is as strong as ever. 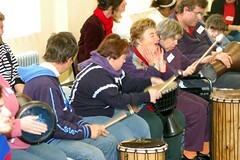 The 2008 winners included the Dandenong Ranges Music Council, the Leichhardt Espresso Chorus and Tutti, an Adelaide-based organisation for young people with disabilities. Despite pockets of activity, on the whole Australia has proportionally fewer active music makers compared with other Western nations such as the US and the UK. Household surveys show there are an estimated 5 million ‘lapsed’ musicians – people who once learned, but no longer play.